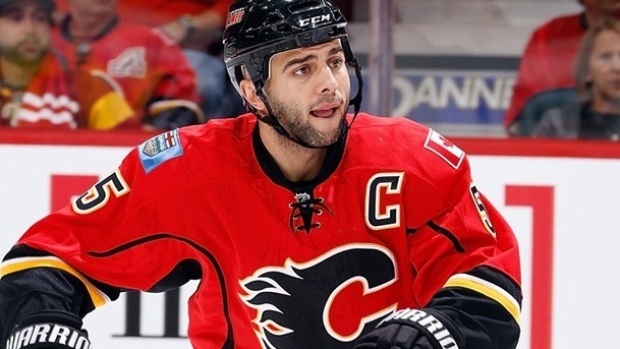 LAS VEGAS - Preliminary negotiations are underway between Mark Giordano and the Calgary Flames on a long-term extension. Getting his captain signed before the start of the season is atop general manager Brad Treliving’s offseason to-do list. Giordano, in Calgary’s organization since signing as an undrafted free agent in 2004, (he spent a season spent in Russia with HC Dynamo Moscow) is entering the final season of a five -year, $20.1 million deal. Sources say the initial ask from Giordano’s camp, headed by agent Ritch Winter, is in the neighbourhood of $9 million per season. Treliving declined to comment on that dollar value amount. Of course, the first ask is usually quite different from where the two sides eventually settle. An average annual value of $9 million would put Giordano in the top five of the NHL in terms of cap hit, with P.K. Subban the only other defenceman in that group. A strong case could have been made for Giordano to be included among the Norris Trophy finalists this season, even though he missed the final 21 games and Calgary’s two-round playoff run with a bicep injury. Giordano, 31, racked up 48 points in 61 games while averaging more than 25 minutes a night. He was leading all defencemen in scoring when he went down in late February. His scoring pace would’ve placed him second to Erik Karlsson in points by blueliners had he played the full 82 games. Giordano and Treliving met for coffee here in Vegas on Tuesday morning. He is a finalist for the NHL Foundation Player Award and the King Clancy Memorial Trophy, two awards which value community and leadership. On the length of the deal, Giordano said he is “realistic” in terms of what he thinks is appropriate. Players can sign a maximum eight-year contract extension. With 510 games played, he has relatively little wear on the tires for a 31-year-old. Treliving sounded optimistic about the talks, saying they’ve been “really positive” thus far. The deal may be put on the back burner for the next few days with the draft and unrestricted free agency approaching. The earliest Giordano can sign an extension is July 1. Many were surprised to hear Ducks general manager Bob Murray speak in such firm tones Tuesday about losing forward Matt Beleskey to free agency. Murray seemed to leave little room for the pending unrestricted free agent to return to the team. “We made an offer and they rejected it immediately,” Murray said. “So I don’t think there’s anything else happening there. I said that when we kept him at the deadline that I doubted it was going to work, and they obviously feel they’re going to do a lot better. Murray’s offer to Beleskey was for four years and $16 million, according to reports. The Ducks are believed to have made that offer last week - and there has apparently been little communication since. Beleskey, 27, is represented by Murray Kuntz of CAA Sports. He’s reportedly seeking somewhere between $4.5 and $5 million per year. The complicating factor for Beleskey is his limited sample size. He netted 22 goals in 65 games, but it’s the only 20-goal season of his career. He was great for Anaheim in the playoffs, and 11 of his goals this season were game-winners - including three in the playoffs. He has also spent part of four seasons in the AHL. Some wonder whether Murray’s critical and very public comments were a negotiating tactic. There is a chance the Ducks make one last pass at Beleskey before July 1, though it seems unlikely at this point. With such a thin free-agent class, Beleskey’s group isn’t bluffing with the amount of money he’ll likely pull in next week. Pending unrestricted free agents may begin the courting process with other teams on Thursday. Brent Burns joked new Sharks coach Peter DeBoer was “stuck with him” for a three weeks at the world championships. DeBoer got a pretty clear look at what Burns could do as he was named top defenceman at the tournament. Burns, 30, has flip-flopped between forward and defence over the years. Where will he play under DeBoer? Burns has been home for just three days since the world championships started. He jetted to Australia for a few weeks after his jaunt in Europe with Team Canada. He’s anxiously awaiting the changes looming in San Jose after the Sharks missed the playoffs for the first time since 2003.